Members of Rocky Mountain College’s Men’s indoor track team pose after a meet. Photo courtesy of Amy Petsch. Rocky Mountain College’s Track and Field Team kicked off the indoor season with some outstanding performances. Rocky’s first weekend of meets took place on Jan. 13, with nine members of the team traveling to Bozeman and five athletes traveling to South Dakota. In Bozeman, four athletes qualified for indoor nationals by competing on the Distance Medley Relay Team. Fred Petsch, Isaac Petsch, Brenden Leaming, and Benson Koech ran a time of 10:32.64, which earned them a ride to Johnson City, Tenn. Bailey Bard and Carrie Cota also set school records in Bozeman: Bailey Bard-60m (8.07), 200m (27.57); Carrie Cota-60m hurdles (10.65). Athletes competing in Bozeman and South Dakota both showed strong performances. 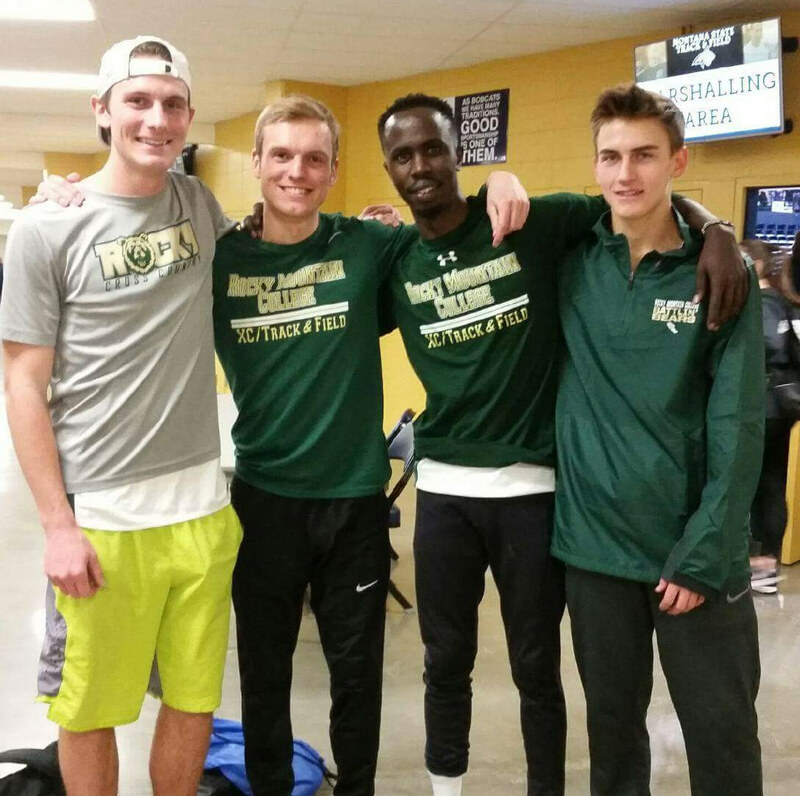 In Bozeman, Fred Petsch, Isaac Petsch, and Benson Koech all also competed in the 800m, bringing in times around two minutes each. Brenden Leaming raced the 200m in 24.37. Eddie Loughran took on the 25 laps of the 5000m with a time of 17:28. On the women’s side, Jaylen Henderson represented Rocky by running the 60m in 8.99 and the 200m in 30.95. Stephanie Robbins and Carrie Cota ran the 800m in respective times of 2:33 and 2:54. In South Dakota, Alex Chase ran the 400m in 1:16 and the 800m in 3:00. Kelsey Crona also competed in the 800m with a time of 3:14. The men’s team ran well with Gino Giovagnoli running the 400m in 53.51 and the 800m in 2:17. Dakota Johnson ran the 400m and 800m, with times of 1:01 and 2:19. Gilly Szweda Mittelstadt ran the distance by competing in the 800m and mile with a 2:29 and a 5:27 respectively. A week later on Jan. 21, Rocky’s team traveled to Spearfish, South Dakota for the Dave Little Alumni Meet. Though the ride was long, the results of the meet were worth the trip. Benson Koech qualified for nationals in a second event, the mile, with a time of 4:24.78, taking 3rd in the event at the meet overall. Additionally, Bailey Bard and Carrie Cota broke their previous school records by breaking their original times in these events: Bailey-60m 8.06, 200m 27.23; Carrie-60m hurdles 10.5. Bailey showed incredible performance by taking 1st and 2nd at the meet in her school record setting sprints, as well as running the fastest split of the 4×4 women’s relay. The following is the rest of the results for the Dave Little Alumni Meet. Benson Koech: 3000m-9:11.98; Fred Petsch: 3000m-9:20.47,mile-4:32.18; Isaac Petsch: 3000m-9:25.38, mile- 4:35.34; Eddie Loughran: 3000m- 9:58.37, mile-4:56.12; Gilly Szweda Mittelstadt: 3000m- 10:31.27; Dakota Johnson: mile-4:58.72, 800m-2:14.62; Lawrence Bryant: 60m-8.17, 200m-26.01; Gino Giovagnoli: 800m-2:05.86; Brenden Leaming: 60m-7.40, 200m-24.31; Josh Triplett: 60m-8.22, long jump, triple jump; Shane Ketchum: mile-4:57.21, 800m-2:17.01; Jaylen Henderson: 400m- 1:07.59; Stephanie Wilson: 800m-2:54.00; Carrie Cota: 800m-2:50.89, shot put, long jump; Alex Chase: 800m- 2:57.33; 4×4 Relay (women): 4:35.51 (Carrie, Stephanie W., Bailey, Jaylen); 4×4 Relay (men): 3:48.85 (Gino, Bren- den, Dakota, Lawrence). “The meet went pretty good, it wasn’t everything I expected, but we can improve a lot. Overall, most of us need to learn how to run on the indoor turns better. It’ll come over time,” said fresh- man distance runner, Shane Ketchum. Time has proven to be on Rocky’s side, specifically the dropping of times in many races. Always training and competing hard, the men’s team knows how to cut the seconds and make a statement. On Jan. 27 and 28, the track team competed in their 3rd meet at the Snake River Open in Pocatello, Idaho. The first day, Carrie Cota and Kelsey Crona competed in the Pentathlon. By doing the 60mH, long jump, high jump, shot put, and the 800m Kelsey earned 1435 and Carrie earned 2200 points. Carrie Cota broke her previous 60mH school record (10.28) and the pentathalon record. The following day the rest of the team were going for the gold, with Benson Koech taking 1st in two events: the mile (4:19.45) and the 800m (1:56.51). Brenden Leaming place 3rd in the 200m (23.65) and Fred Petsch took 3rd in the mile with a time of 4:23.16. Benson Koech and Fred Petsch mile times were National qualifying standards! Bailey Bard broke the 200m school record again with an impressive 26.54 seconds. The rest of the day’s results were as follows: Bailey Bard- 60m (8.11), Carrie Cota-60mH (10.64), Jaylen Henderson-400m (1:07.64), Stephanie Wilson- 400m (1:13.86) 800m (2:53.71), Kelsey Crona-60mH (12.71), Lawrence Bryant- 200m (25.1), Gino Giovagnoli-400m (51.3) 800m (2:05.30), Fred Petsch-800m (1:58.72), Isaac Petsch-800m (2:05.37), mile (4:26.72), Dakota Johnson- 800m (2:14.18) mile (4:53.47), Shane Ketchum- mile (4:52.95) 3000m (9:44.47), Eddie Loughran- 3000m (9:24.88), Gilly Szweda Mittelstadt-3000m (10:38.43). In the following weeks the track and field team has indoor meets every weekend. The team, as a whole, seems to be excited to compete and ready to continue getting better. Coach McLean said, “We’re off to a great start, setting school records and having the men’s DMR team and milers qualifying for nationals. When the team gets in top shape and continues to work hard we should have a strong season.” With the distance team running many miles, the sprinters pound out intense speed work, and the field athletes practicing every day the team will improve and be in tip top shape for what’s to come. In other words, they’re right on track.